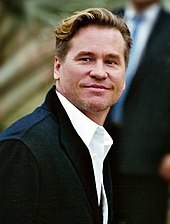 Val Edward Kilmer (born December 31, 1959) is an American actor and film director. He is of Cherokee, English, French Huguenot, German, Native American, Scotch-Irish, Welsh and Swedish descent. He has 2 children, Mercedes Kilmer and Jack Kilmer. As quoted in Rebecca Ascher-Walsh, "Cool Hero: Val Kilmer". Entertainment Weekly (June 30, 1995). This page was last edited on 30 May 2018, at 12:29.